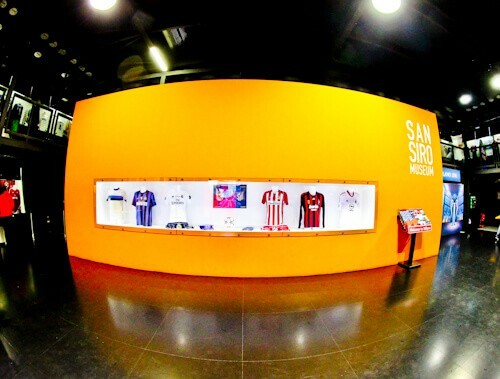 Stadium tours of the San Siro are self guided. There’s no need to book online, just turn up at the stadium during opening hours. 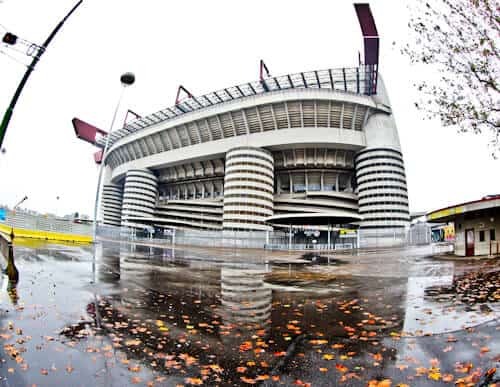 If you’re lucky, AC Milan or Inter Milan will be playing at home when you visit Milan. The San Siro stadium is located in the San Siro district of Milan. It’s about 5 km from the historic center of Milan. This means you must take public transport unless you want to take a 5 km walk. How to get to the San Siro stadium by public transport is easy. Just take the Milan metro to the San Siro station. When you exit the metro you’ll see the huge San Siro stadium. 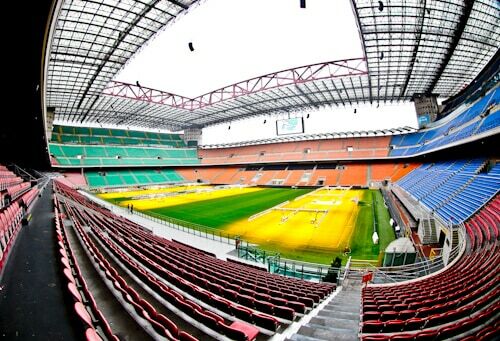 The capacity of the San Siro stadium is 80,018. This makes it the largest stadium in Italy and one of the largest in Europe. It’s a five star stadium meaning it can host major European competitions. It has hosted 4 European Cup finals. It most recently hosted the European Cup final in 2016 when Real Madrid beat Atletico Madrid on penalties. Six games of the Italia 90 World Cup were played at the San Siro. The quarter final was the most important where West Germany beat Czechoslovakia. Legends such as Jurgen Klinsmann, Lothar Matthaus, Diego Maradona and Marco van Basten all played in this stadium during Italia 90. The first stop on the stadium tour is the museum. In the museum you’ll find an Italia 90 section with memorabilia from this tournament. There are signed shirts from famous players who have played at the San Siro. You’ll also find historic AC / Inter Milan teams and information on the history of the clubs. The only part of the Press Area you’ll gain access to is the interview wall. After matches, the players / managers will give quick interviews here. As 2 different teams with different sponsors play here, there are 2 different walls. One for Inter Milan’s sponsors and the other for AC Milan’s. It was set up for Inter Milan when I visited (above). This wall is a good place to take your Instagram selfies. 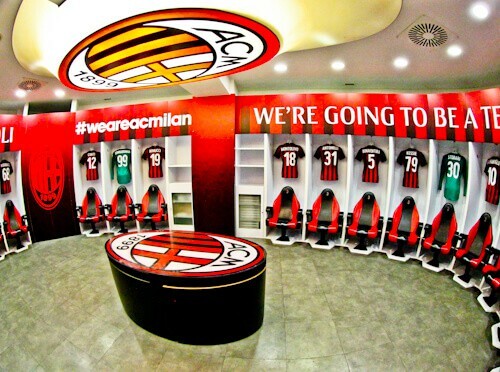 AC Milan have one of the most impressive dressing rooms I’ve ever seen. The way they have integrated their team colors and logos into the room is perfect. Many famous players have used this dressing room. Brazilian legend Ronaldinho used to play here regularly. Andriy Shevchenko, Marco Van Basten, Ruud Gullit, George Weah, Paolo Maldini and David Beckham are all AC Milan legends. Andriy Shevchenko and George Weah have gone on to be politicians. In fact George Weah became the president of Liberia. 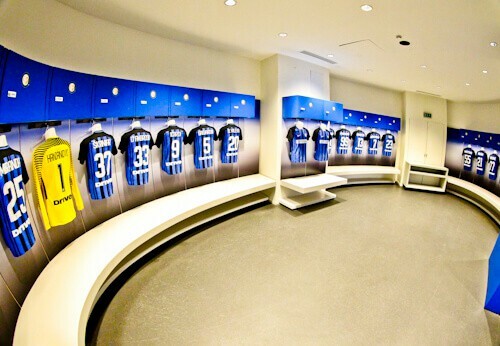 The Inter Milan dressing room although impressive, was not as impressive as their neighbors AC Milan. It’s the same size but doesn’t have a table in the middle. With the lack of table and blue color it feels more spacious. Many famous players have used this dressing room. Brazilian Ronaldo played at Inter Milan. Other historic Inter Milan players are Marco Materazzi, Mario Balotelli, Walter Zenga, Roberto Baggio and Jurgen Klinsmann. Zlatan Ibrahimovic played for both AC and Inter which meant he used both changing rooms. 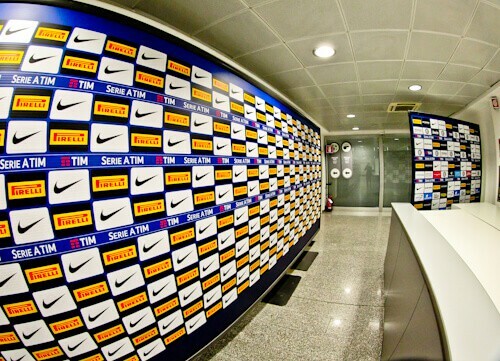 As part of the San Siro stadium tour you do not visit the away team dressing rooms. After visiting both the dressing rooms of AC and Inter Milan you’ll have seen enough already! I was told the away dressing room is the same as the home teams, only in neutral colors. 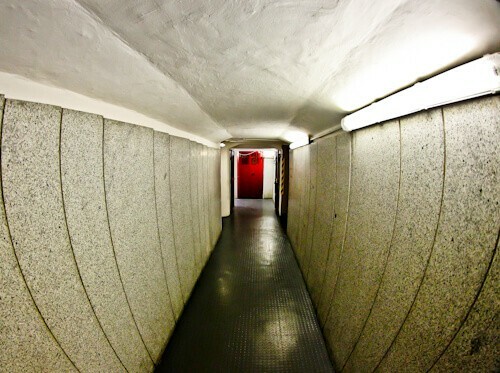 The San Siro has an intimidating players tunnel. When walking down the players tunnel it feels like you’re walking through an old underground war tunnel. There are also metal gates which gives it a prison feel. This must intimidate the away teams on a cold winters night. The players tunnel leads to the corner of the stadium. After the interesting walk through the players tunnel, you’ll reach pitch side. Imagine walking out here to over 80,000 screaming (or booing) fans. You’re permitted to stand in the corner of the pitch. After this you must walk around the stand to view the stadium from different angles. Unfortunately it’s not permitted to sit in the dugout. The club shop at the San Siro is unique. How many club shops have you been to which sells merchandise exclusively for 2 teams? Half of the club shop is red and all things AC Milan. 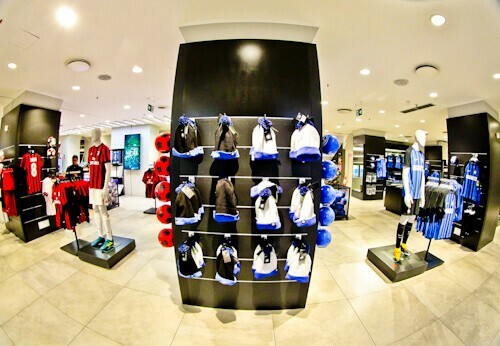 The other half of the club shop is all things blue and Inter Milan. It’s easy to get to the San Siro stadium from anywhere in Milan. First you enter the Milan Metro. You need to get to the purple line, M5. Take line M5 to the last stop which is San Siro. The station itself is of a football theme, making it an Instagram worthy metro station. 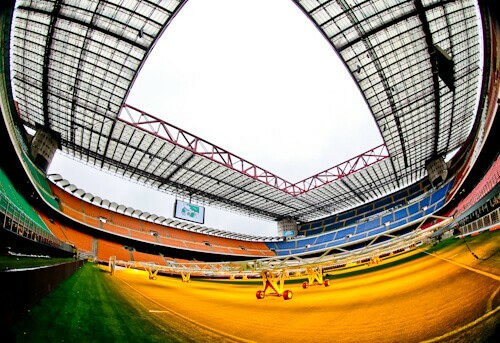 Enjoy your visit to the San Siro stadium. What to see and where to stay in Milan. A stadium tour of the Allianz Stadium, home of Juventus. I have to be honest, I’m on the blue side of Milan, I cheer for Inter! 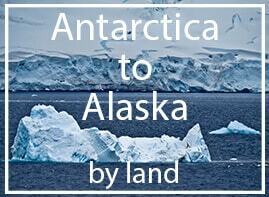 I’d still visit both changes rooms though and check out oth ides of the souvenir store. Being here to watch a Madonnina match would be the best atmosphere! I found you through the George Weah connection. He is now president of Liberia! I would have loved to have seen him play at the San Siro in his best days. He’s the only African to win the Ballon d’or! Hi Francis, I agree George Weah is a legend! 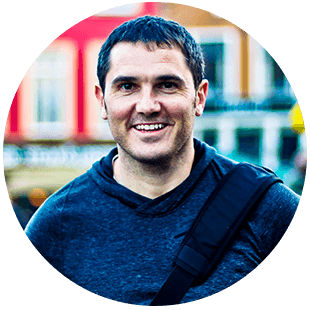 Great images James! I used to love watching AC Milan at the San Siro. I remember watching them play as a child on TV. I can’t remember the name of the TV programme which aired on UK TV every Sunday afternoon but this article has brought back some childhood memories. Goooolattizooo! I remember that, Football Italia! How cool that you were able to explore many of the iconic football stadiums in Europe! I am personally not a football fan. However, I love sports in general. It must be exhilarating experience to be in a stadium that have witnessed so many important Italia 90 games! I’m back in Italy as I write this, and about 2 hours away from Milan! San Siro is huge, and I never knew all the facts about footballers. Especially the one about the guy who became the President of Liberia, what a transition! The dressing rooms of both Inter and AC Milan do have a homely feel. That players tunnel definitely does look a bit like a war tunnel! What a contrast from the rest of the well-decorated spaces. The split store selling two kinds of merchandise is kind of cute–it reminds me of being at home in the USA, where retailers almost always stock the closest two universities team gear, and of course, those teams are often rivals. The San Siro is a stadium of legends! I’m a huge AC Milan fan and I’m visiting Milan soon. The good news is that they are playing at home when I visit (I wouldn’t want to watch Inter!). You’ve inspired me to take a stadium tour too – I’ve got to get me that selfie in the Milan changing rooms! You sound like quite the soccer fan and it’s awesome how you get to tour the actual stadiums in Europe. 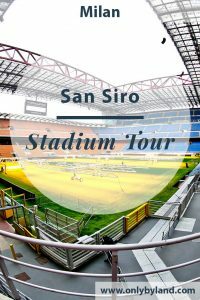 Although I used to play quite a bit back in school, I don’t really pay attention to sports anymore but I would love to tour the San Siro Stadium nonetheless. And I agree, those dressing rooms look very cool. A historic Italia 90 stadium is reason enough to visit the San Siro stadium. I were to walk through that players tunnel before the start of a match I would really feel pretty intimidated and claustrophobic. AC Milan dressing room is iconic and at the same time, quirky. Huge AC Milan fan here – I’m going to watch a game soon. Thanks for the stadium tour, the San Siro looks great! I hope it’s a good game and AC win of course!